Habitat: It fears prolonged frost. Leaves:composed of leaflets round at the end. Flowers: pink, variegated purple; 4 petals, obovate to oval. Fruit: pod of 15-30 cm long; 12 - 15 seeds. 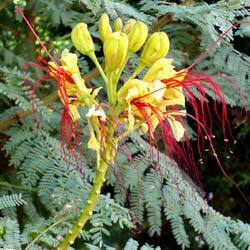 Use: the caesalpinia decapetala is a nice ornamental tree, a few bulky. It can become invasive in the lands where it was introduced, as at Mauritius or in the Polynesia. Caesalpinia gilliesii is a shrub with compound leaves, very light, which resemble those of Albizia. Leaflets are small and rounded. Habitat: It appreciates sunny place. It can resist a short frost. Flowers: pale yellow in spikes, with long, scarlet stamens.